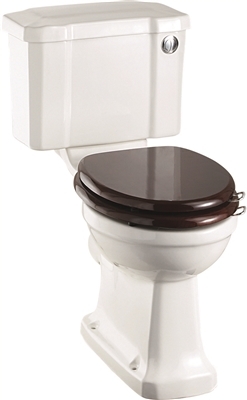 The RRP for the Burlington Regal Close Coupled Pan with Push Button Cistern is £299, but we are selling at the unbeatable price of just £200! That's a £99 saving from the RRP! Included in the price is the toilet pan and cistern. Please note that the toilet seat is available separately. Burlington offers a classic range of exquisite traditional bathroom pieces. Every piece is lovingly crafted and hand finished with exceptional care using the finest materials and manufacturing processes. Outstanding fittings and accessories complete the luxury concept and set the range apart in bathroom styling.